Marketing material for the modern mechanical watch almost always includes a description of the the movement’s frequency. Whether it is described in terms of Hertz (Hz) or vibrations/beats per hour (vph/bph), you will have likely grown familiar with frequencies that range between 2.5 and 5 Hz (18,000 to 36,000 vph). You may have even sensed that the higher the frequency, the more accurate a movement gets. If higher frequency really delivers better performance, why do watches still exist that run below 5 Hz (36,000 vph)? And what happens when you turn it up to 10 Hz or even beyond? In this post, I try to dispel some of the myths and clarify some of the truths about high-frequency mechanical movements. But first: the basics. Frequency is described in the Merriam-Webster dictionary as “the number of repetitions of a periodic process in a unit of time.” The word applies to alternating current or to oscillations. An oscillation commonly describes a wave of sound or electromagnetism, but this is also where watch frequency comes in. A mechanical watch movement features a power source (the mainspring), transmission (the gear train), and regulation (the escapement, balance wheel, and hairspring). The power flows from the mainspring, via the transmission, to the escape wheel, and it is through the oscillations of the balance wheel that the power is ultimately and precisely expelled and the movement’s frequency is manifested. Each time the balance wheel swings in a given direction its roller jewel knocks the lever, unlocking the escape wheel. The escape wheel delivers an impulse to the balance via the lever, powering a new vibration, before locking once more. This process takes place several times per second in a mechanical wristwatch. As important as it is to the movement, the “breathing” of the hairspring and the frantic stuttering of the lever and escape wheel is equally mesmerizing to behold in action. When we describe a movement as having a frequency of 4 Hz or 28,800 vph, we describe the same phenomenon but in different ways. The balance wheel, in conjunction with a Swiss lever escapement, vibrates in two directions: it rotates clockwise until the hairspring causes it to stop and swing counterclockwise. This double vibration equals one oscillation; a 4 Hz balance will do this four times per second. Because there are two vibrations for every oscillation, a 4 Hz balance will vibrate eight times per second, equaling 480 times per minute, which is equivalent to 28,800 times per hour. While there do exist some very impressive and interesting exceptions, the most common mechanical movements operate between 2.5 and 4 Hz. When you consider the mechanics involved in a single oscillation, it becomes clear that there are limitations to higher frequencies, beyond which a movement might explode into a bird’s nest of gnarled wheels and springs. Quartz movements, however, are not limited by many of these principles because they are regulated by the oscillations of a quartz crystal while an onboard microchip counts the vibrations and issues instructions for the motor to distribute the power. Rather than a pulsating hairspring in a mechanical regulator, the quartz movement is controlled by the oscillations of a quartz crystal conducting an electrical impulse, and this is determined by the cut of the crystal and its inherent piezoelectric properties. As a consequence, the most common frequency of a quartz watch is a rather staggering 32,768 Hz. That’s around 10,000 times faster than a mechanical regulator. The integrated circuit will count 32,768 vibrations before sending a message instructing the stepper motor to progress the transmission. While that is blisteringly fast, there also exist high-performance movements that run at 262,114 Hz. And then there is the 1955 Cesium atomic clock, which oscillates at a frequency that looks like a telephone number: 9,192,631,770 Hz. In fact, it looks like a telephone number with country code! So there is fast, faster, and super fast. But how does that benefit a watch? Does higher frequency guarantee a more accurate watch? By C.O.S.C. standards, a mechanical chronometer-grade movement is expected to keep the time to within a deviation of -4/+6 seconds per day, which is about 36 minutes per year. A quartz movement will deviate by as little as 0.007 seconds per day, which is about 25 seconds per year. The JILA Strontium Atomic Clock will not lose even one second for 15 billion years! That’s more than three times longer than our planet has existed. As the increasing accuracy of these movements coincides with a rapid increase in frequency, one might conclude that a higher frequency delivers more accurate timekeeping. But this is only somewhat true. Although in practice you will likely find that a higher frequency movement will keep more accurate time, the truth is that the most stable regulating organ – not the fastest – will enable the watch to keep more accurate time. That’s one of the main reasons why stationary (i.e., stable) clocks can be so accurate. The difference in accuracy between the quartz watch and the mechanical watch is not therefore entirely down to frequency speed; it’s also determined by how well the watchmaker can control the many elements that disrupt the movement: temperature, power, friction, gravity, shock; these have as much to do with the relative inaccuracy of a mechanical movement as the speed of its oscillating balance wheel. In theory, with a constant power source and temperature, frictionless gears, zero gravity, no shocks and no magnetism, a mechanical movement of any frequency could compete with a 32,000 Hz quartz movement. But this is not the world in which we live. One of the main reasons that a quartz movement is more accurate than a mechanical movement is because it has the more stable frequency in real world conditions. The voltage can be made constant; gravity has no notable effect on its oscillations, and even temperature fluctuations can be compensated. Both the mechanical and the quartz movement need to be expertly adjusted to maximize performance, but the underlying superior stability of the quartz oscillator puts it head and shoulders ahead of its mechanical counterpart. We already know that quartz is more accurate than a mechanical movement, but what is the difference between two mechanical movements, one running at 2.5 Hz and the other running at 5 Hz? Within the confines of mechanical watchmaking, both are capable of being highly accurate. The materials used, the construction methods, and the adjustments made by the watchmaker are of arguably of greater importance. The poise of the balance wheel and changes in amplitude caused by fluctuating mainspring torque are more likely to keep a watchmaker up at night than the movement frequency. 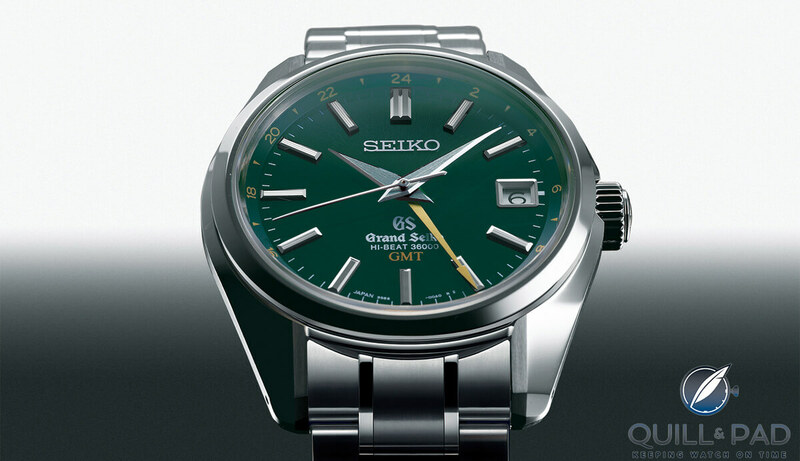 There are fine examples of chronometer-grade and/or high-end movements that run at frequencies below 4 Hz. This is fairly common among the more traditional observatoire-modeled watches, such as the Leroy Chronomètre Observatoire and C.O.S.C.-rated Ferdinand Berthoud Chronomètre FB 1 (2.5 Hz and 3 Hz respectively). For more on the FB 1, see Ferdinand Berthoud Is Reborn With FB 1 Thanks To Chopard’s Karl-Friedrich Scheufele. A Greubel Forsey Double Tourbillon Technique holds the record as the most independently tested precise wristwatch and it has a balance beating at a relaxed 3 Hz (see The Greubel Forsey Double Tourbillon 30° Technique: What’s Friction Got To Do, Got To Do With It!?). The none-too-shabby Patek Philippe 5950 split-second chronograph is powered by a 3 Hz movement, as is the Vacheron Constantin Harmony Ultra-Thin Grande Complication Chronograph, while the A Lange & Söhne Datograph Up/Down runs at 2.5 Hz. In many of these cases, the balance wheel might be noticeably larger because a watchmaker will reduce oscillating frequency often by increasing the weight, and subsequent moment of inertia, of the balance wheel. Slower frequency movements can also be found in more avant-garde watches designed to showcase particularly large balance wheels as visual novelties, such as the MB&F Legacy Machine range (2.5 Hz) and the Martin Braun (Antoine Martin) Slow Runner, which runs at just 1 Hz (see The Slowest Watch In The World). Even sports/tool watches are not exclusively high frequency: Audemars Piguet uses a 3 Hz movement in its Royal Oak Offshore Diver range, while Rolex opted for a 4 Hz movement instead of 5 Hz when it modified the Zenith El Primero caliber (which usually beats at 5 Hz) for the Daytona; Rolex was still able to achieve “superlative” accuracy despite this reduction. Indeed, when it comes to mechanical accuracy, expert construction, adjustment, and overall movement quality can take precedence over the speed of a regulating organ. Why the need for ultra-high frequency then? But if there are perfectly accurate movements beating at 4 Hz and lower out there, why are high frequency movements often marketed in conjunction with high accuracy, in watches such as the Grand Seiko Hi-Beat (5 Hz) or the Chopard L.U.C. 8HF (8 Hz)? This is because a higher frequency helps to deliver a slightly more stable rate. Remember, the mechanical watch is at war with the elements, all of which conspire to cause fluctuations to stability. A mechanical watch can deliver excellent accuracy with moderate or low frequency, but the higher frequency is another arrow to the bow of a brand that wants to throw everything it has at accuracy. Watchmaking, however, is about compromise. And in many cases these watches may need more frequent servicing to retain their factory-fresh accuracy. After all, a 5 Hz movement will vibrate up to 63 million more times than a 4 Hz movement within a year of constant use. That’s the equivalent of about three extra months of 4 Hz vibrations – a lot of additional friction. The issue of heightened friction offers more adventurous watchmakers the opportunity to innovate. 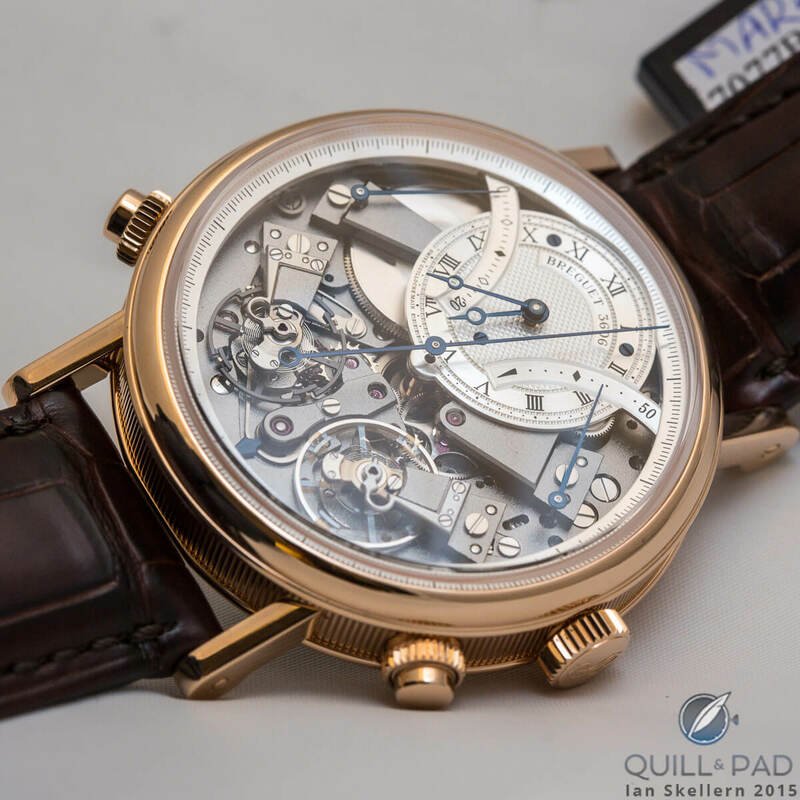 Take the Breguet Classique Chronométrie 7727, for example, which is powered by a 10 Hz movement: it counters the excessive friction by placing magnets behind the balance jewels (for more on it, see Why I Bought It: Breguet Classique Chronométrie 7727). As a consequence, the balance staff is held in place by a combination of friction and gravitational field rather than friction alone. The Chopard 8HF uses silicon for its impulse pin, lever and escape wheel, while the Breguet extends the use of that material to the hairspring, which is particularly important considering the use of magnetism within the movement. Silicon offers excellent friction resistance and weight saving, both of which help deliver higher frequencies while minimizing the effect of wear on the movement components. In conclusion, high frequency helps to deliver a slightly more stable and therefore slightly more accurate watch, but it is at a cost. One could easily argue that a well-constructed and adjusted 4 to 5 Hz movement represents the sweet spot. Does high frequency provide greater shock resistance? The greater stability of a higher frequency movement is often attributed to a sportier, shock-resistant quality in a watch. This is because the higher frequency movement will do a somewhat better job of dealing with the distorting effect of gravity pulling on the balance from different angles or when it endures a sudden shock. Think of two cars driving over the same pothole, one travels at 30 kilometers an hour and the other at 80 kilometers an hour. Both cars experience a shock, however the car traveling slower experiences the disturbance for a longer period of time. In a similar way, the higher the frequency of a movement the more quickly it can recover from shock. While the precision of a higher frequency movement is less affected by shock than a lower frequency movement, there are three important caveats. First, as with accuracy, an increase in balance frequency is only one of several tools that a watchmaker can employ in an attempt to create a shock-resistant watch. The Incabloc system, which is found on many modern mechanical movements, the pare-chute system (invented by Abraham-Louis Breguet in 1790), and other proprietary shock absorbers placed on the balance bridge or wider movement will most significantly contribute to the shock resistant qualities of the watch. Secondly, the primary goal for shock resistance is to avoid damage to parts. When a momentary shock disrupts a handful of vibrations it will not put a perceivable dent in your watch’s accuracy, but a snapped balance staff certainly will! Thirdly, another method of resisting shock in the movement is to increase the moment of inertia. As we have just discussed, this can be achieved by increasing the weight and/or size of the balance wheel, which consequently lowers the frequency of the movement. There does not exist any meaningful objective data using a large enough sample size on the actual timekeeping impact of a shock or a series of shocks inflicted upon a range of movements with frequencies between 2.5 and 5 Hz. However, we are certainly talking about unperceivable differences not worth losing sleep over; differences that better serve the marketing of a watch than the wearing of one. This is why you still see manufactures such as Audemars Piguet using the 3 Hz Caliber 3120 in its Royal Oak Offshore Diver watches. Yes, it beats at 3 Hz, but it has a double balance bridge, shock absorber on the pivot stone, and its variable inertia blocks allow the watchmaker to adjust the watch to a high level of accuracy. So dive away! For those occasionally needing to handle a pneumatic drill or ride a bike down a mountain, it’s best to keep a cheap quartz watch in your collection. Does higher frequency mean a more accurate chronograph? This is where things get really interesting and more objectively clear. When it comes to recording lapses of time, if your goal is to record at the most granular interval possible, then high frequency absolutely does mean a more accurate chronograph. Consider two one-meter rulers: one has 100 cm markings, the other has 1,000 mm markings. They both measure a meter with equal accuracy and they both measure to the nearest centimeter with equal accuracy, but only one is capable of measuring to the nearest millimeter. This logic also applies to the movement frequency: any mechanical chronograph can be geared to measure to the nearest hour, minute, and second. But when it comes to measuring the space between seconds, increased balance frequency is king. A 4 Hz balance with Swiss lever escapement vibrates eight times per second. With each vibration, the escape wheel unlocks so that it can deliver an impulse to the balance. In doing so, it graduates one tooth further along its rotation. This means that in any given second, the 4 Hz-tuned escape wheel allows the gear train to progress by 8 increments. Similarly, a 5 Hz movement creates ten vibrations per second, allowing the gear train to progress by ten increments each second. A foudroyante second hand, which indicates fractions of a second, can therefore display one-eighth of a second or one-tenth of a second with a 4 and 5 Hz movement respectively. The foudroyante hand displaying one-sixth of a second on the Jaeger-LeCoultre Duomètre à Chronographe, for example, indicates that its Caliber 380 has a frequency of 3 Hz. 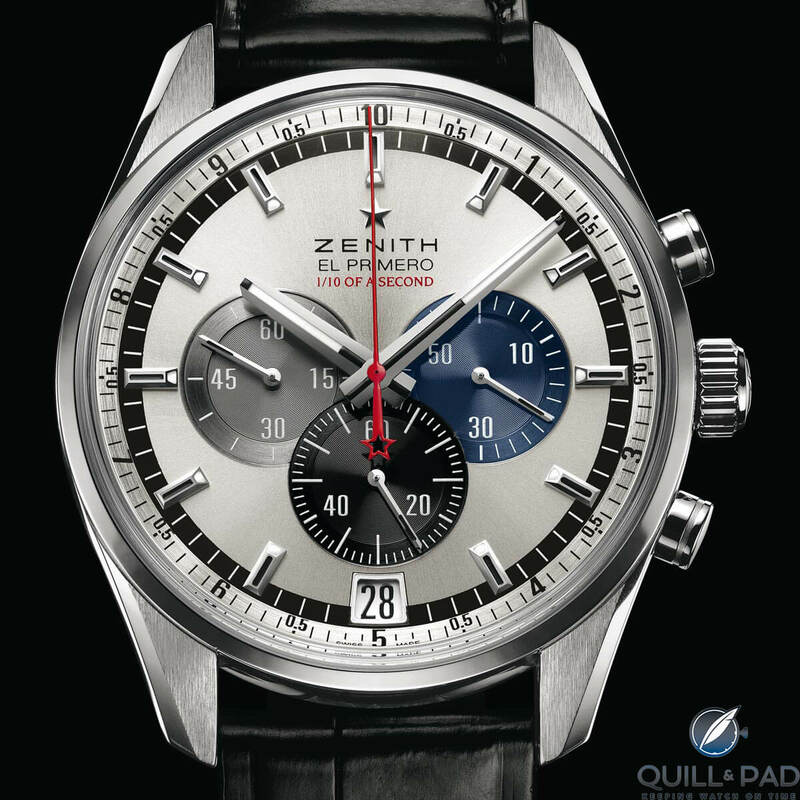 Likewise, the Zenith El Primero Striking Tenth with its special chronograph hand displaying one-tenth of a second is clearly powered by the famous El Primero 5 Hz frequency. Alternatively, a watchmaker can use regular chronograph gearing and simply add the applicable graduations in between the second markers for the chronograph hand. This works for lower frequencies too. Take the A. Lange & Söhne Datograph Up/Down, which has five intermediate markers between every second marker allowing the wearer to take a reading to the nearest fifth of a second – not bad for 2.5 Hz. 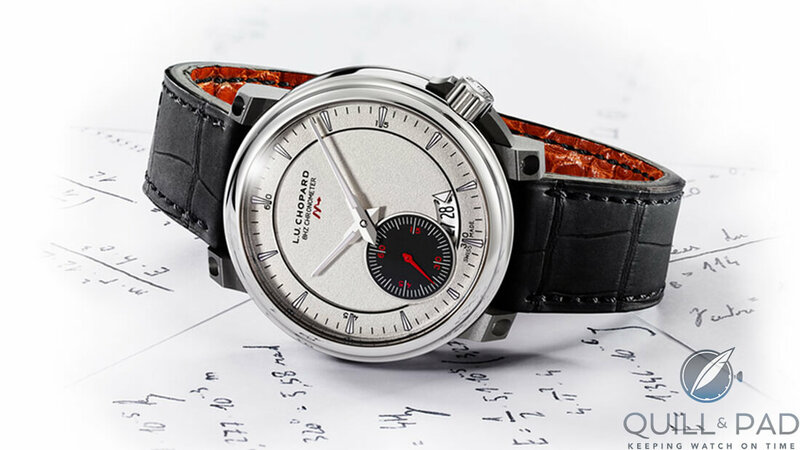 It might surprise you, but there exist some beautiful high-end chronographs on the market that use similar graduations but with 3 or 4 Hz movements; consequently the frequency does not map to the markings, which should instead be providing readings to one-sixth or one-eighth of a second. The higher you go in terms of frequency, the greater the granularity, but also the more challenges that need to be overcome. Take power, for instance, which in many cases is in higher demand with higher frequency balances. This is why you will often see independent balance wheels and escapements set aside for the running of a high-precision chronograph, while a more traditional set is used for the timekeeping gear train as evidenced by the TAG Heuer Mikro range of chronographs and the Breguet Reference 7077 (see Breguet La Tradition 7077 Independent Chronograph: Twins Or Not?). Inertia is another issue. As you approach frequencies as blistering as 50 Hz, and even 500 Hz, you will see the traditional balance wheel being abandoned altogether. The 500 Hz TAG Heuer Mikrotimer Flying 1000, for example, places the bulk of its balance mass on a small aluminum plate that is closely huddled to the balance staff (picture a ballerina bringing her arms to her body to increase rotation speed). The TAG Heuer Mikrogirder does without a balance and hairspring entirely, using the pivoted tension between two blades (“girders”) to deliver a nosebleed-inducing 1,000 Hz, allowing the user to track time to the nearest 2,000th of a second! Although we are venturing further in to the realms of prototype and theory and away from the chronograph, it is worth noting the research and development work of De Bethune in this area. Many of the brand’s existing models feature space-age balance wheels, hairsprings and shock absorbers, but since 2007 it has been exploring frequencies that far exceed the limits of a traditional balance and escapement. The Résonique is a revolutionary oscillator consisting of a magnetic rotor (similar to an escape wheel) and four tiny magnets suspended on an “acoustic resonator” that surround it (like a hairspring). The rotor is not locked or unlocked by a pallet lever, but instead by the fluctuating magnetic forces of the four rapidly oscillating magnets. De Bethune has already developed a working prototype that delivers 928 Hz, but the theory has opened doors to frequencies as dizzying as 20 KHz. Summing up, a higher frequency does allow more accurate chronograph readings, but it is limited by gearing and markings on the dial (and then there is the matter of human reaction time, which pretty much absorbs the extra accuracy!). A well-adjusted 2.5 or 3 Hz chronograph can be just as good as a 4 or 5 Hz chronograph if there are no graduations between the second markers or if the user is happy with rounding to the nearest one-fifth or one-sixth of a second. As we have already mentioned, some of the most coveted chronograph movements in today’s market do just that. So next time you hear a watch being derided or praised for its high or low frequency, you may want to counter with arguments about friction, wear, adjustments, service intervals, marker graduations, power reserve, shock absorbers, and a good dose of human perspective! * This article was first published on September 3, 2016 at Measuring The Time Between The Seconds: The Truth Behind High-Frequency Movements. Great article! Always wanted to know the difference and the effects the different frequencies have. By the way, what does it mean when you mentioned that the GF is the world’s most independently tested precise wrist watch?